The VWR Gravity Convection Incubator provides you with superior temperature stability and uniformity with an environment ideally suited to delicate samples. Gravity convection is naturally gentler and creates an airflow that wont dry out samples, and is great for open containers and plates. This lab incubator has a wide temperature range of between 5° above ambient to 75 °C, with a uniformity of 0.6°C, with perforated stainless shelving designed to allow heat to evenly distribute, are easily adjustable and will hold up to 55lbs each. The interior of this VWR incubator is a corrosion resistant stainless steel with coved corners for easy cleaning and has a standard access port to allow for external monitoring or for peripheral instrumentation. This 6.85 cu ft incubator is microprocessor controlled from the user-friendly digital panel, that’s located near the top for easy access and allows users to set their parameters, silence alarms and offset times. 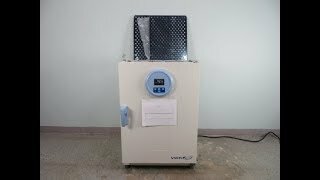 The VWR Gravity Convection Incubator also features over temperature protection with dual sensors, and connection to standard RS-232 interface to a computer. This incubator has a tempered glass door to help maintain temperatures while still providing users with visual monitoring and is a flexible solution that’s ideal for not only microbiology and bacterial research but also food and beverage testing, and heated storage. These VWR Gravity Convection Incubators are new in box and has been tested by our service team as part of our quality control process. Instrument has a clean bill of health. All of our lab equipment comes backed with our standard warranty. Should you have any questions, please don't hesitate to contact us.